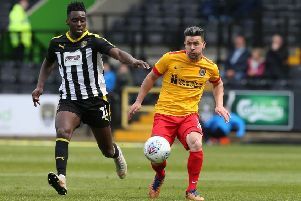 Boss Keith Curle has admitted the Cobblers squad was left in a state of ‘shock and disbelief’ after players were racially abused ahead of last Saturday’s clash with Notts County. The incident happened ahead of the squad’s pre-match meal at the Village Hotel in Nottingham, and although shocked himself, Curle also believes it is ‘a good thing’ that players are ‘now able to talk about’ such abuse when it occurs. David Buchanan has revealed that, among other things, an unidentified man had called out to the Town players ‘all you white lads will play much better today, because you black lads have got no heart’. 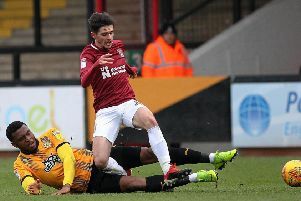 The Town defender also reported how the man then picked up a chair after he was confronted by some of the Cobblers players, before the incident was defused with the players walking away. Curle didn’t witness the incident, but he is very proud of the way his players reacted to the provocation. “First and foremost, I think the players conducted themselves in the right manner,” said Curle. “They were shocked to be confronted as a team, as for somebody to come up and say what he said, and there was then a knock-on effect of disbelief. “But the players reacted in the right way, because it could have escalated, but credit to the the players that it didn’t. Curle then added: “We arrived at the hotel, and then the players went for a walk before the pre-match meal, and the incident happened as they were going on their walk. “At that time the staff and myself were in having our final review on the presentation we are going to give to the players. “So we didn’t hear about what had happened as a staff until after the players had come back in for their pre-match meal. “I then went outside to see if the lad was still there, and he wasn’t, and then it was a case of focusing the players’ minds again (ahead of the game, which the Cobblers drew 2-2). “I spoke to a few of the players to see how they felt, and we were able to then get the focus back on the match. What happened to the Cobblers players was one of three reported incidents of racial abuse involving Football League clubs on Saturday. At Brentford, Derby player Duane Holmes was racially abused by a fan sitting near the dugout, while following Wigan Athletic’s draw at Bristol City, Nathan Byrne received racist abuse on Twitter. And although Curle is saddened and appalled such things happpen, he is at least encouraged that such indidents are now coming to light, and being deal with. “I think the good thing is, and it’s not just the changing room, the football club and the local community, we are able to talk about it, and it is good to talk about it,” said the Cobblers boss.